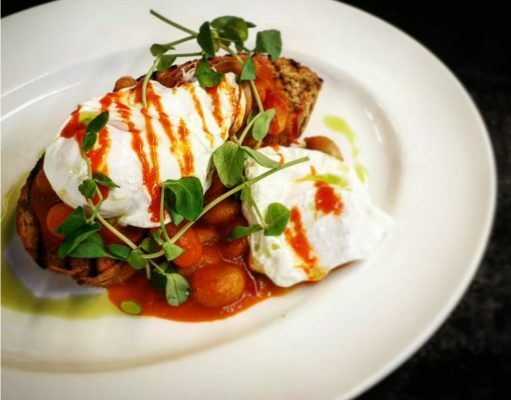 Treat Dad or a special man in your life to a delicious Kentish Breakfast Brunch on Father’s Day in our wonderful restaurant, which leads out to a sunny courtyard terrace. For Father’s Day only we are offering you the chance to enjoy a breakfast like a King and normally only available to overnight guests. Our new Kentish Breakfast Menu features favourites such us our traditional Full English Breakfast consisting of English bacon, sausages, baked beans, hash brown, grilled tomato and mushrooms with a choice of fried, scrambled or poached egg and white or wholemeal toast or for the more modern twist, why not try our new chilli spiced beans on toast, with butter beans in a tomato, sriracha and tabasco sauce on homemade toast with poached eggs. For vegetarians we offer our Full Vegetarian Breakfast or why not opt for a bowl of warm homemade porridge, with plenty of continental breakfast offerings, such as chocolate pancakes and freshly baked muffins, along with fresh fruit and yoghurt. Breakfast times are being offered at 9:30, 10:00, 10:30 and 11:00. Spaces are limited, so please call our events team soon to make a reservation on 01227 865350. You may be interested to know that Sung Eucharist (with Sermon) is at 11:00 in the Cathedral.